Mattress toppers are usually 3-5cm thick, lie on top of the mattress and are designed to give the sleeper ‘s spine just the right amount of resistance, so that he or she sleeps without picking up posture problems. Mattress toppers are also an excellent way to revitalise a tired mattress. The mattress may not be as young as it once was and is likely to have given up over the years, which means that a person’s body weight is not evenly distributed as he/she sleeps. Even If the mattress is new, it still needs a mattress topper in order to offer the spine the support it requires. Mattress toppers are supplied with natural fillings, synthetic fillings and memory foam. Goose feather mattress toppers offer the natural comfort, warmth and luxury of a traditional feather mattress. Microfibre mattress toppers are filled with a sumptuous 'bounce back' filling which retains its shape just like new, giving the bed extra softness and comfort. A memory foam mattress topper moulds itself to the body shape, the temperature sensitive ‘memory foam’ provides total support for your spine and joints helping to relieve any aches and pains, ensuring a restful night’s sleep. www.supply2hotels.co.uk can supply the correct mattress topper to suite your needs. Advanced Micro fibres are encased in a soft-touch 100% polyester peach skin cover for gentle cushioning softness. 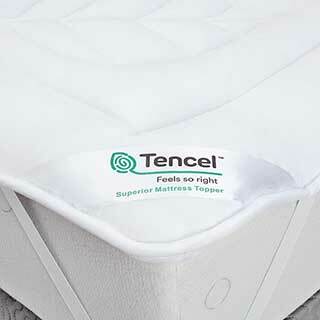 It is designed to feel and perform just like a down filled mattress topper, with the benefits of synthetic filling. The luxurious, soft-touch, genuine microfibre filling provides comfort and warmth whilst you sleep. This Microfibre mattress topper is filled with a sumptuous 'bounce back' filling which retains it's shape just like new, giving the bed extra softness. The microfibre filling gives resilience and softness. Elasticated corners, non-allergenic, dustmite proof, bound edges and fully washable at 60°C make this topper ever more popular. Available in single, double king size and super king size. Soft and comfortable 100% microfibre filling with a 100% microfibre cover. Elasticated corners to fit easily on the mattress. Luxurious and comfortable mattress topper which moulds to the shape of the body giving a peaceful night's sleep. 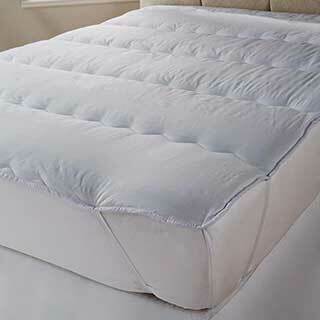 A supremely soft 2.5cm (1") mattress topper with deep filled diamond stitched pockets. Filled with soft luxurious hollowfibre, a mattress topper softens the feel of the bed and moulds to the shape of the body, giving a blissful night's sleep. Mattress toppers lie on top of the mattress and are designed to give the sleeper ‘s spine just the right amount of resistance, so that he or she sleeps without picking up posture problems. 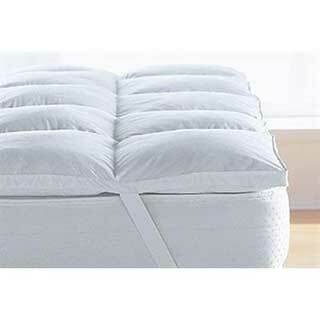 Mattress toppers are also an excellent way to revitalise a tired mattress. The mattress may not be as young as it once was and is likely to have given up over the years. Adding a mattress topper may solve the problem. This deluxe channel quilted mattress topper is ideal for giving new life to an old mattress, thus helping a person sleep peacefully and ease aches and pains. 2.5cm (1") quilted topper. 68pic polycotton cover and bound edges. Easy to fit with corner elastics. With a 640grm polyester filling this topper is ideal for creating that extra comfort and luxury whilst protecting your mattress at the same time. Washable at 40 degrees centigrade. Inner Filling: 30% Tencel, 70% polyester Hollowfibre. Fitting: Elasticated corner bands. Outer Cover: 100% polyester microfibre. Available in Single 90x190cm, Double, King, Super King and Zip & Link sizes. Zip & Link size is a set of 2 which zip together, Each topper measures 90x200cm.